When we think about two partners in a relationship with the same sun sign, the first words that come to mind are harmony, love and peace. In the case of the relationship between an Aquarius man and woman, this may very well not be true. It could either be great love, or a complete disaster. It will not take too much effort for the Aquarius man or woman to attract each other. Both are witty personalities who enjoy spontaneous conversations. Breaking the ice will not be an issue and conversations will flow endlessly. Both partners value their freedom. Their free spirit and outgoing nature is definitely a plus point when individual personalities are concerned, but is this a benefit in a relationship? The answer is probably no. Imagine two people who are socially very active and have a large set of friends. Multiply this by two if both partners may come from different backgrounds and may not have common friends. This relationship will be subject to higher than average human interaction and involvement. 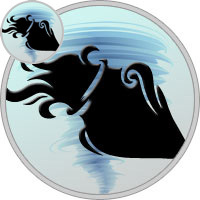 The Aquarius man and woman both have a very active social life and it is easy to get lost in the world of outings, meetings, and gatherings. The bond between the two partners has to be solid in order to bring them back to ground realities. Another typical trait, again closely related is personal space. Both partners enjoy their own personal space, physically and emotionally. They like to be on their own sometimes. This trait may even work in their advantage. Possessiveness, jealousy and other issues related to trust take a back seat because of the similar outlook towards life. Arguments and fights will be lesser than the average couple. Both partners will acknowledge each other’s needs to be left alone at times. This can provide balance and stability to the relationship. Romance levels in this relationship can vary. Without a doubt, the first few dates and period of courtship will be full of smiles and surprises. Both partners are intellectually strong and their outspokenness is like icing on the cake. But the typical Aquarius man or woman is not romantically inclined. The funny thing is that their conversations will be animated and can keep them engrossed for hours. For an outsider, this may seem very romantic and a picture perfect frame may be formed in the eyes of the beholder if the couple is spotted having a “full on” conversation on a table at the local cafe. However, this may not be felt by the partners themselves. It is very important for both partners to make an effort to keep the excitement alive in their love life. Without this, romance levels are likely to fade away. Imagine watching the sunrise on that misty morning - without that hot cup of coffee, or that romantic date - without that glass of wine, or the cosy moment on the couch - without your favourite movie. Love relations are peaking! The Aquarius man and woman are full of energy and enthusiasm. Physical relations will be free, inventive, rewarding, and extremely satisfying. Times spent in the bedroom will be long. Both partners love the outdoors and it would not be surprising if steamy sessions inside the bedroom end up out in the back yard under the crisp moon light. Aggressiveness and subtleness are both involved in this roller coaster ride. Neither partner will be held up by nervousness or preconceived notions. They are both in for a wild ride! Both partners are loyal when it comes to testing times in the relationship and hold a special place for each other in their hearts. However, the Aquarius woman and man tend to hide emotions. Aloof, arrogant, absent minded, you can call them anything you want - they are not bound by sentiments. Emotional intimacy will need to be forced upon on these two souls. In a committed relationship, they will happily co-exists and be best friends. They can surely be the pillar in each other’s lives. Both partners will need to ensure that they spend enough time together, away from the attention of the world. They both make a great pair. Whether they can transform this strong bond into a loving, nurtured and long term relationship depends on willingness of each partner to compromise, by a bit, on the sense of freedom. It is definitely a relationship that they want to hold on for life!